I know. I know. 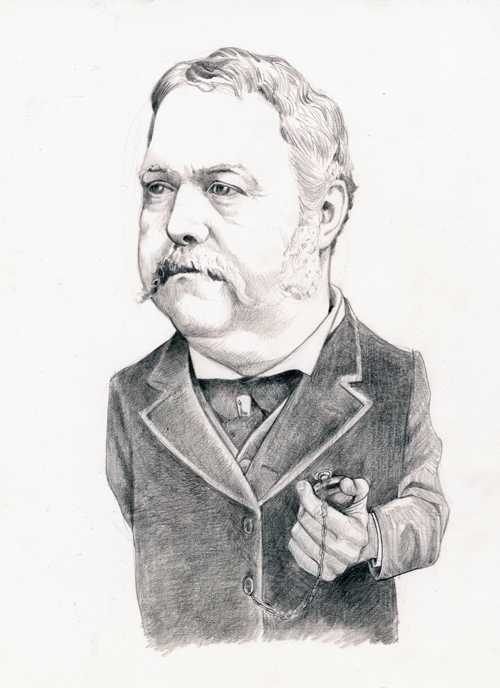 Chester Arthur is a political superstar perhaps the most famous president apart from Lincoln. But here is a drawing with which to refresh your memory. He served one term. He was sworn into office after Garfield was shot by an aspiring office seeker. Arthur signed the Edmund’s law into effect which outlawed polygamy. He thought that polygamy was morally detrimental to the family. I guess that means that he thought the family was possible to define (these were the days before Dreamworks and the Disney Channel clearly taught us that family has no genetic definition, but is rather made up from misfits that one meets on a road trip). Arthur was also a civil rights advocate, and popularizer of Yellowstone National Park among other things.